Medical Officer, Psychiatrist, Special General Physician, Dental Hygienist, Neurologist, OBGY Gynecologist, Cardiologist, Anesthetist, Physician & Surgeon) and Medical Office Jobs. 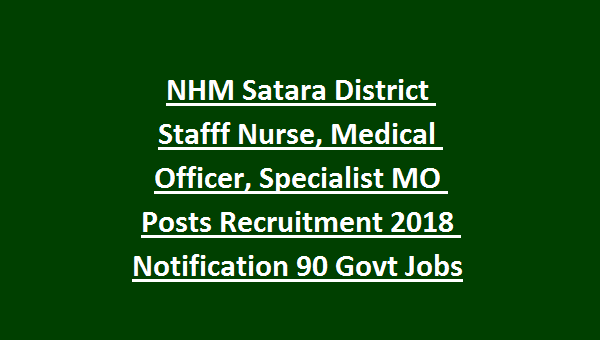 There are total 90 posts in this NHM Satara District recruitment 2018. Last date for submission of application form to NHM Satara District is 05-12-2018. 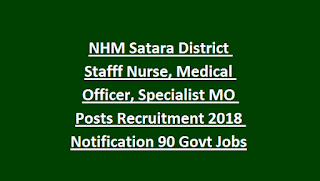 Pay Scale, no of posts, qualifications and other details about this NHM Satara District Staff Nurse, Medical Officer, BAMS MO jobs recruitment is updated below. There are total 90 vacancies in this District Health Society of Satara District under NHM. Age limits for Sister Incharge, Staff Nurse, Dental Hygienist, BAMS Medical Officer posts is 38 years. For all other posts upper age limit is 61 years. Candidates selection will be based on merit in educational qualifications, interview and documents verification. Candidates who are having necessary qualifications they can download application form from the official website of www.zpsatara.gov.in. Last date to submission of application form to NHM Satara District is 05-12-2018.